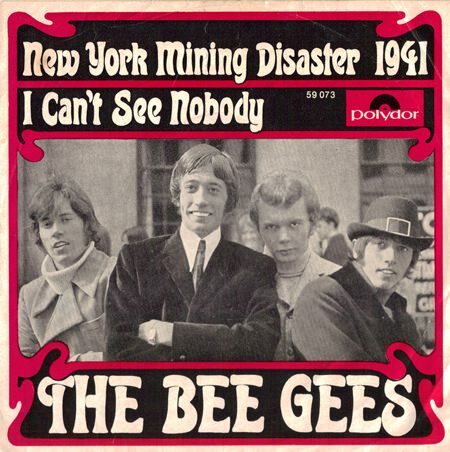 A lonely, fragile, haunting little ballad “New York Mining Disaster 1941” came floating across the airwaves in April 1967. Everybody thought it was a secret Beatles-release. The melody and arrangement were painfully beautiful, Robin Gibb’s voice so sad you wanted to cuddle it, and the words… what was that all about, a horrible mining disaster back in 1941, a guy buried underground, all alone in the darkness, hoping for rescue, waiting for death. The fact that there never was a mining disaster in New York in 1941 made the recording even more mysterious. Who were these guys, did they exist at all? The Bee Gees would prove to be real enough. Three brothers from the Isle Of Man (the family emigrated to Redcliffe, Australia in 1958) and two hired guns from Down Under (who had become permanent members when “Bee Gees 1st” came out). In 1966, after eight frustrating years of struggle the brothers Gibb had finally become local stars thanks to the “Spicks And Specs”-single. Then they left it all behind and sailed off for England. 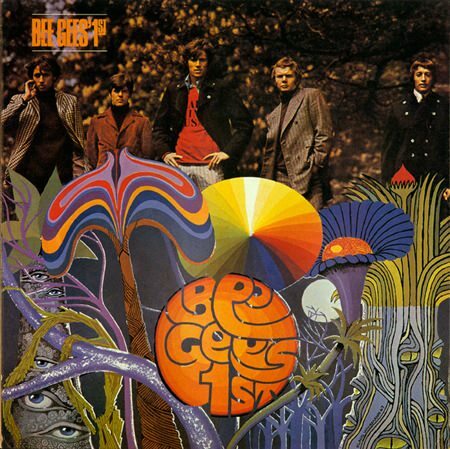 “Bee Gees 1st” was not their first LP, but rather their third. But “1st” was a much more useful moniker than “3rd” to build a new career on. In a way they started from scratch, with a wonder of an album. The 14 cuts still sound as fresh, mysterious and beautiful as they did 46 years ago. Every song is built around catchy, but gentle melodies lifted by magnificent harmonic singing. Barry and Robin share the lead vocals between them just like John and Paul did on The Beatles’ records. The gorgeous, elaborate arrangements give every song its own identity, this too very much in the spirit of the Liverpudlians. Like The Beatles their music evolves from the basic beat group set-up of guitars, bass, drums and eventually keyboards, adding mellotron and orchestra, but never overdoing anything; every detail is there for a reason, nothing gets in the way of song and performance. The album sounds so effortless, elegant and mature to come from a new unproven and young band. It is advanced pop music, airy, colourful and easy on the ear. The careful use of classical elements and light psychedelia increases the album’s magic, it slides perfectly in where it belongs, in the slipstream of “Sgt. Pepper” (though actually recorded before Pepper was finished), a true participant in the summer of love. The stereo separation is typical for its time, limited as they were by the four track tape recorder, but that sound has its own unmistakable charm. I am very fond of the way the strings are recorded, dry, close-miked, in your face, just as the Beatles did it. If Barry and Robin are the voices of the album, Maurice sure is its soul. A gifted bass player, as important for the early Bee Gees-sound as McCartney was for The Beatles, his melodic, syncopated and springy runs were copied by numerous young players. He was also a wizard on the mellotron, way ahead of most players at the time (The Moody Blues could never have bettered what he does to “Every Christian Lion Hearted Man Will Show You”). The three hit singles from the album, “New York Mining Disaster 1941”, “To Love Somebody” and the US only “Holiday” are all slow, melancholy ballads. But those tracks are just one part of the story as the rest of the album is quite up-tempo, taking the listener on a joyful ride through the same soundscapes as “Revolver” did. It’s very much a rock record, chock-full of hooks and eclectic turns, commerciality and psychedelia, comedy and whimsy. There was something for everybody. A track like “To Love Somebody” would be covered by both soul and country singers – even Leonard Cohen. The sheer quality of the Gibb brothers’ writing transcended the time and style they were recorded in. I still prefer the originals though. “Bee Gees’ 1st” is simply a delight all the way from the baroque intro to “Turn Of The Century” to the fading drama of “Close Another Door”. The sleeve design matches its contents. A summery photo of the band gently lowered into Klaus Voormans’ organic and colourful psychedelia. The brothers Gibb were a horn of plenty and a gift to humankind. Six months and three outstanding hit singles later, the Bee Gees had a new strong album ready for the Christmas market. Even greater successes were to come. But nothing they ever did later would recapture the freshness and naive beauty of “Bee Gees 1st”. How could they. We were soldiers once… and young. Next articleA KERS for bumpy roads?